Edited and published by Johnny and Giselle Brewton. The first issue was published in 2005. Bagazine is a branch of the X-Ray Book Co. tree. Contributors are asked to submit an edition of 100 copies (plus 3 proofs) for the collaborative effort. Unlike “normal” magazines Bagazine points focus at assemblage, handwork and print making, photography, painting, chapbooks, graphic design, typography, letterpress, Visual Poetry and the unusual. 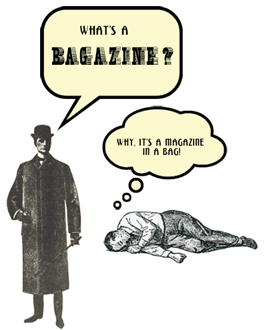 Bagazine explores the assemblage landscape and modern subculture of Bagism and creative Happening.